Music and Entertainment Industry Curricula: A Case for Autonomy? 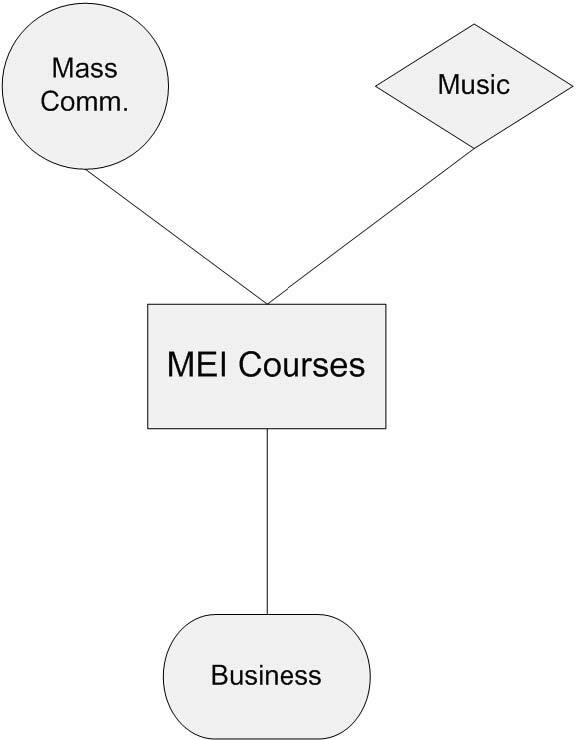 During the first thirty years of music and entertainment industry education, herein referred to as MEI, three basic curriculum models emerged in four-year degree programs. The first, and most common, is the music department model; but two more patterns emerged later: the business school and mass communication models. Observations of curricula through catalogs and websites indicate that MEI educators seem to agree on a core curriculum, but a question remains as to what is the preferred major: music, business, communications, or a new free-standing MEI discipline. Current practice begs the question, “What is this discipline and where does it belong?” One might also justifiably posit that by its very nature it is interdisciplinary or multidisciplinary. Perhaps after thirty years it has attained critical mass and needs autonomy from the three traditional disciplines. These questions are perplexing for the MEI educator as there are many variables and those variables are not the same at every institution. This paper will discuss some of those variables as well as frame the problem for future questions and discussion. There is evidence of music business classes being offered as early as the late 1940s at Bradley University, and the University of Miami is generally recognized as having the first audio technology program in 1965.1 However, many programs date their origins to the early and mid-1970s and this is when the patterns began to emerge. The music department model had already become established with the University of Miami, and later with other institutions. Around the same time, the mass communication model appeared at Middle Tennessee State University and the business school model appeared at Belmont University. Both of the latter programs have become among the largest in the world. Within a few years, MEI programs were appearing throughout the country and the Music and Entertainment Industry Educators Association (MEIEA) was formed in 1979 to bring the interests of educators and professionals together, and to serve the needs of the newly forming discipline as an association. As of this writing, MEIEA’s website lists 56 schools in its directory of institutional members. It should also be noted that a number of community colleges throughout the country have MEI programs as well, but this discussion is limited to four-year baccalaureate programs. Although the three curriculum models span three traditional departments and as many colleges on some campuses, there are striking similarities between programs, and a somewhat standard core has emerged in the emphasis. Typically, this core consists of music and recording technology courses and music business courses. 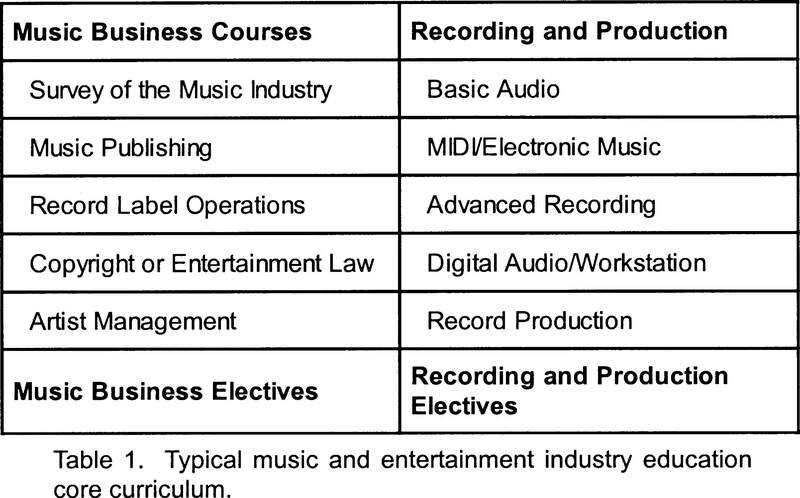 Currently, that means a mixture of recording, production, MIDI, and digital audio workstation (DAW) courses on the technology side; and courses covering the three-income-stream model on the music business side: music publishing, artist royalties, and touring/ personal appearances. There are variances among institutions regarding how these subjects are organized within courses, but topically most programs cover the same territory. There are also differences in the amount and type of electives available, but there are far more similarities than differences. Though course names vary somewhat between institutions, table 1 gives a broad view of the typical curriculum. 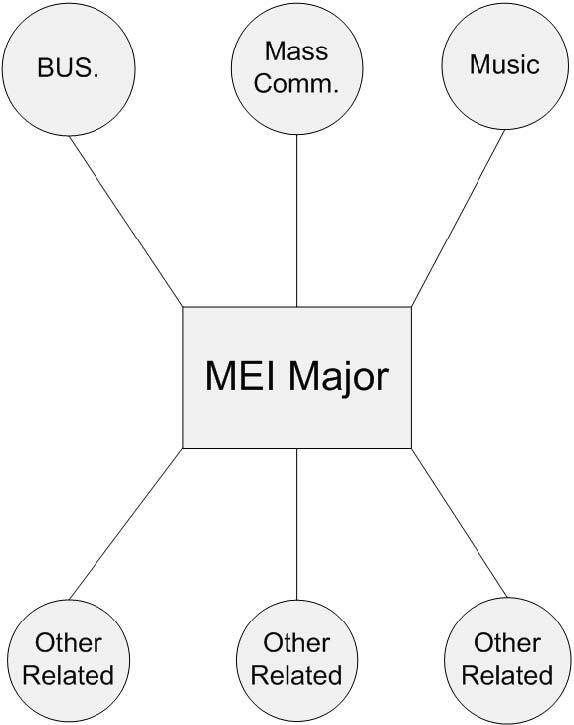 While the hub and spoke model is representative of current practice, it is interesting to note that the hub in the model is MEI studies, while the spokes are the given major in the program: music, business, or communications. Within the context of the model, it would seem that the spokes have too much importance or emphasis, given that the primary area of study is MEI. The hub, after all, is MEI, and the spokes are tangential to the hub. With few exceptions, most curricula in higher education are constructed in such a way as to emphasize the major and create supporting experiences and coursework around that framework. Model 1. Hub and spokes representing current practice. . Since most programs are tracks or emphases with a department, control of the curriculum can be cumbersome. This is further exacerbated by the various accreditation bodies for those departments: The National Association of Schools of Music (NASM), The Association of Collegiate Business Schools and Programs (ACBSP), and The Accrediting Council on Education in Journalism and Mass Communications (ACEJMC). Each agency has standards that programs must meet in the major (the spokes) which sometimes are not in the best interest of the MEI program (the hub). This strong gravitational pull toward the spokes creates limited options for new courses and revision in core MEI curricula. Faculty in organizations with even the best of collegial relationships sometimes find themselves at philosophical and professional odds with their colleagues over curriculum issues. Curricula in MEI programs are a moving target, and due to the rate of change in the technology and how it affects the industry, those curricula should be in a constant state of review and revision. This can be difficult because striking the balance between the new tools and the timeless, fundamental concepts can be daunting. Educators are at constant risk for teaching too much of the tools and too little of how the tools will affect the concepts. However one views the curriculum, it is difficult to be responsive and current when the primary discipline, or the one that has overarching control, lives in one of the spokes and not the hub. One might conclude that the ideal curricular model would place the major in the hub and the supporting areas in the spokes. These supporting areas can be in the form of traditional minors, customized minors, or simply as supporting coursework (see model 2). Model 2. Curricular model with MEI major as the hub. path is that of attaining degrees in related fields. The question is, what is “related”? While there is some agreement among institutions, there has been no official codification of this due to the fact that programs span at least three disciplines. 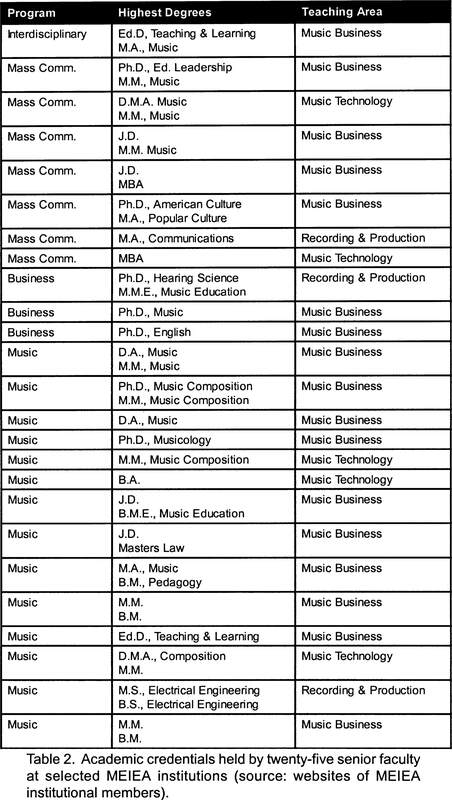 Doctorates in a variety of music fields are common in both music business and recording technology areas regardless of the departmental placement of the MEI program. The Ed.D. and Ph.D. in education are considered to be terminal at some institutions as well, and a few faculty and chairs of MEI programs hold these degrees. Others include the doctorates in English, American Studies, Hearing Science, Communica-tions fields, Marketing, and the JD. Some institutions accept the masters in a similarly related field as terminal. In addition to academic credentialing, most institutions value industry experience and state in their job announcements that they expect at least a modicum of that experience. 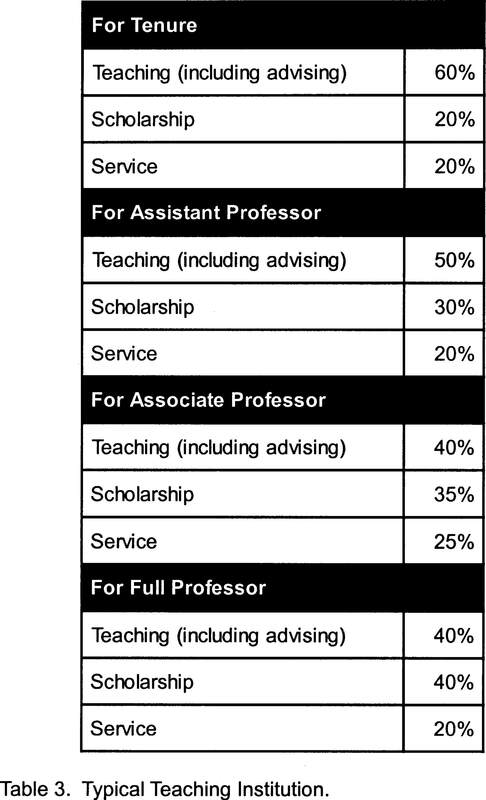 A survey of twenty-five senior faculty from MEIEA institutions illustrates this diversity4 (table 2). Because the discipline is not presently free-standing, there is no codification of a terminal degree or doctoral degree in the field since technically, the field does not exist. Special efforts have to be made by those who wish to establish their academic credentials through the related degree. Higher education has traditionally recognized the doctorate, or the Master of Fine Arts (MFA) in some creative areas, as the terminal degree. Recent years have seen MEI-related MBA programs springing up in several places as well as the Master of Music in either Music Business and Entertainment Industry or Sound Recording Technology. Since these masters degrees fall out of the tradition of the doctorate as terminal, reality for many faculty is the masters is not— although there is some evidence that exceptions are made at some institutions. But there is no uniform agreement across the discipline as to the masters being terminal. Decisions about graduate school are perplexing; this issue will be one of great interest in the coming years. Middle Tennessee State University started an MFA program in the fall of 2005 which appears to have the hallmarks of a terminal degree in content and tradition. However, most doctorally-credentialed faculty have degrees in related disciplines. Some customize coursework somewhat or do an inordinate amount of directed readings related to MEI. While this has helped many faculty attain something of a related doctorate, it is only a substitute for a true graduate program. When hired in a tenure-track position, faculty will typically have to meet certain criteria as they move through rank and tenure. In many institutions a six-year probation period is met before tenure is awarded, assuming the faculty member was not granted years toward tenure in the initial contract. The faculty member is reviewed and renewed (or not renewed) yearly. The decision for renewal, tenure, or promotion is based on certain criteria (though there is no concrete standard for those criteria). Three areas, plus an essential minimum of collegiality, are usually evaluated. They are teaching, research/scholarship, and service. The traditional model for a teaching institution calls for increased emphasis on research/scholarship as one moves up the ranks towards full professor. It is expected that the faculty member will have already established himself or herself as a good teacher along the way, as well as maintaining a modicum of service to the institution and profession. While it is difficult to quantify a system of this type, the chart in table 3 is an effort to approximate and represent such a model. Teaching and service are somewhat simple to evaluate. Research/schol-arship, on the other hand, presents some standardization problems. If one does traditional research or writes for juried journals the situation is fairly clear cut. There are, however, few opportunities short of the MEIEA Journal and MEIEA conference presentations directly related to MEI studies. Some faculty avail themselves of opportunities with the Audio Engineering Society (AES), the National Academy of Recording Arts and Sciences (NARAS), and other organizations from the related disciplines. Creative activity has long been acceptable for fields like music and the arts. This would include performances, recitals, exhibitions, etc. That still leaves the innovators to be creative and come up with their own new ways to receive credit for scholarly activity and receive rank and tenure. Some institutions have broadened their interpretation of creative activity to include audio and video products, multimedia productions, the development of software, and other activities tailored to a particular department and its discipline. Review and documentation of creative activity in the field presents special problems as well. Traditionally, public performances were enough to meet the basic criterion of being acceptable work. Whether the specific performance was local, regional, national, or international gave more or less weight to the activity. Some audio, video, software, multimedia, and other innovative activity may never be heard by large—or even small—audiences but its contribution to the field may be quite significant. Some departments have allowed a panel of outside reviewers in the discipline to satisfy the review requirements. Although this helps the faculty member it still puts him or her at a disadvantage in that it carries the perception that an exception is being made. Peer evaluation committees are sometimes comprised of, or include, faculty from other disciplines who may not understand the nuance. Faculty members clearly need opportunities to develop as scholars and to present their research and ideas. It is a practical matter, as illustrated by these special problems, as well as a philosophical one. With the problems and questions about the terminal degree, and the special problems of scholarly activity, MEI faculty face personal and professional challenges. If an individual chooses to pursue a doctorate in music or education, he or she may be able to be hired at some institutions but not all, let alone stand for tenure or be promoted. Career options could possibly be limited. Having outlined some of the largest issues of curriculum and faculty, the following question appears more urgent each year: has MEI attained the critical mass necessary to stand alone as its own discipline? Perhaps the issue is more urgent at some institutions than others. The variables are not the same at all institutions. Some work together across disciplines better than others. Yet other institutions have no interest in accrediting bodies and are free from that variable. However, I posit that all MEI programs deal with these issues enough to give the question urgency. Columbia College Chicago. (2005) from . Accessed February 10, 2006. Marcone, Stephen. “The Opinions of Music Management Graduates on Music Management Curriculum.” MEIEA Journal 4, no. 1 (2004): 43–59. McCain, Claudia. “A Model Music Business Curriculum.” MEIEA Journal 2, no. 1 (2002): 14–27. Middle Tennessee State University. (2006) from . Accessed March 10, 2006. Music & Entertainment Industry Educators Association. (2006) from . Accessed March 9, 2006. Nepkie, Janet. “The Development of a Theoretical Basis for Four-Year Undergraduate Programs in Music Business Education.” Unpublished doctoral dissertation. New York: New York University, 1992. Ornstein, Allen C., and Francis P. Hunkins. Curriculum Foundations, Principles and Theory. 2nd ed. Boston: Allyn and Bacon, 1993. Terrell, Phillip A. “Digital Audio in U. S. Higher Education Audio Recording Technology Programs.” Unpublished doctoral dissertation. Atlanta, Georgia: Georgia State University, 2001. The University of North Alabama. (2005) from . Accessed February 10, 2006. 1 Phillip A. Terrell. “Digital Audio in U. S. Higher Education Audio Recording Technology Programs,” Unpublished Doctoral Dissertation (Atlanta, Georgia: Georgia State University, 2001): 2. 2 . (The University of North Alabama, 2005). Accessed February 10, 2006. 3 . (Columbia College Chicago, 2005). Accessed February 10, 2006. 4 (Music and Entertainment Industry Educators Association, 2006). Accessed March 9, 2006. ROBERT GARFRERICK is Associate Professor of Music and Eminent Scholar in Entertainment Industry at the University of North Alabama. Dr. Garfrerick teaches music business and songwriting classes. In addition to his teaching duties he is the Director of the Entertainment Industry Center. He has written songs recorded by Crystal Gayle, T. G. Sheppard, Marie Osmond, Johnny Lee, Gus Hardin, David Slater, and others. Prior to joining the faculty at UNA, Garfrerick was on the faculty at Middle Tennessee State University in the Department of Recording Industry in the College of Mass Communication. Dr. Garfrerick has a bachelor of music degree from the University of Alabama, a master of arts in music from Middle Tennessee State University, and a doctorate in education from Tennessee State University. His research interest is in the area of creativity, songwriting, and curriculum development. He presents and publishes this research regularly. Additionally, Garfrerick has been a speaker, presenter, performer or clinician for groups such as The Songwriter’s Guild of America (SGA), The Balsam Mountain Songwriter’s Camp, Nashville Songwriters Association International (NSAI), and the Music & Entertainment Industry Educators Association (MEIEA). He is a member of the National Academy of Recording Arts & Sciences (NARAS), The American Society of Composers, Authors, and Publishers (ASCAP), the Muscle Shoals Music Association (MSMA), MEIEA, and NSAI.